The Eagle or previously Aaron K is a 269 foot freighter originally build in the Netherlands in 1962. A fire had made this cargo transport ship of no use anymore, when the Eagle Tire Company decided to donated money to scuttle her in 1985 as an artificial reef to the joy of many professional fishermen and scuba divers. The ship was cleaned; renamed to the Eagle and blasted with holes to let it sank on its starboard side near Islamorada. This artificial reef with mooring buoys at its bow and stern is a popular but crowded dive site located off Lower Matecumbe Key. Use the anchor lines as the current is often strong and the wreck can often not be seen from the surface. 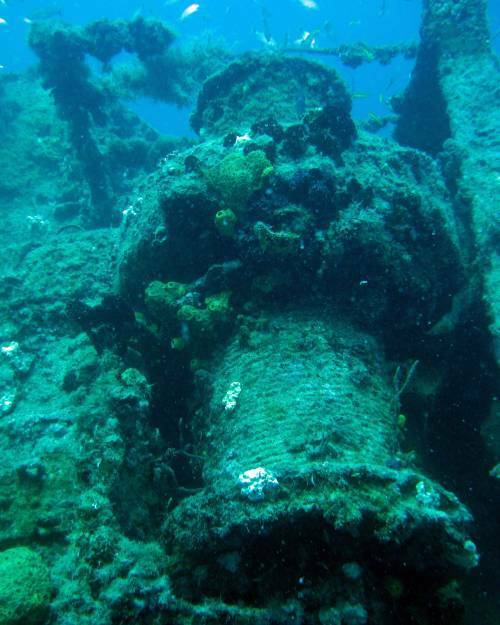 A hurricane broke the wreck in two in 1998 making it even more interesting as parts of its internal structure and cargo holds can be seen now for non wreck trained divers as well. Unfortunately its name was written on its starboard side which cannot be seen anymore. Other interesting sights are its crows nest, mast and smokestack. Penetration of the wreck by trained wreck divers can be done but take care not to reduce visibility by kicking up the enormous amounts of silt. Although still relatively young, coral, sponges and spiny oysters have succeeded to live well on many parts of the wreck. High currents have made these waters rich with food attracting all types of fish; crevalle jacks, silversides, barracuda and cobia are some of the fish spotted frequently.